Welcome back to our blog! At Arne Wellness Center, your health and your family’s health are our main concern. With the oncoming spring season, we know that many of you are highly active and will be getting outdoors to walk, bike, hike, camp, and fish as soon as the weather warms up. While springtime brings with it new life, radiant blooming flowers, and warmer weather, it is also the start of tick season. 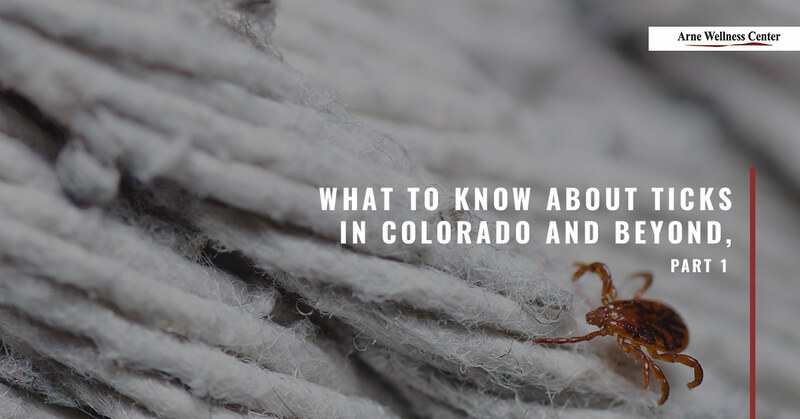 Therefore, we have compiled a list of frequently asked questions about ticks in Colorado to help you understand them better, so that you can avoid them during the spring and summer months. Please continue reading below. What Are the Most Common Ticks Found in Colorado? According to Colorado State University, there are over 30 species of ticks in Colorado. The Rocky Mountain wood tick and American dog tick pose the greatest risk to humans and pets as they carry and transmit tick-related diseases. Ticks can be divided into two main families of species: hard-shelled ticks (Ixodidae family) and soft ticks (Argasidae family). Hard-shell ticks are more common to the area. A hard-shelled tick will attach itself to a host, usually a human or animal, and feed for several days until it becomes engorged with blood and drops from its host. A soft tick (rare in Colorado) will attach itself to any large mammal, including livestock, and will feed occasionally, yet regularly, for months at a time. What Are the Most Common Tick-Transmitted Diseases in Colorado? Colorado tick fever is very common in the state and Four Corners region. Rocky Mountain spotted fever is very rare in Colorado, though there have been reported cases. Tularemia can infect humans and animals, and is commonly found in small rodents and rabbits. The Colorado Tick-Borne Disease Awareness Association suggests that Lyme disease is commonly transmitted by black-legged ticks and deer ticks to humans. While some studies report that Lyme-carrying ticks are more active on the east coast, others suggest that these ticks are indeed in Colorado, making the ongoing discussion of whether or not patients can get Lyme disease in our state a highly controversial topic. Can You Get Lyme Disease When You Travel? Yes. The Centers for Disease Control (CDC) is an excellent source for viewing where the highest number of Lyme cases are reported in the United States. View this resource when traveling to other parts of the country to see where Lyme disease transmitted by ticks is prevalent. Keep in mind that while the CDC does not list Colorado as a high-risk region where Lyme disease occurs, other studies suggest otherwise. Therefore, it is always best to take preventative measures to protect yourself, your loved ones, and your pets when traveling to areas within the state where ticks are common. At Arne Wellness Center, Dr. Arne is a Lyme-literate doctor and a wonderful resource for any questions you may have about ticks and Lyme disease in Colorado and beyond. If you are currently suffering from Lyme disease and would like to begin Lyme disease treatment, contact us today to get started.